Apparently, Richard Reeves is worried that the top echelons of the U.S. middle class—those earning over $120,000—are separating from the rest of the country, and pulling up the drawbridge behind them. “The upper middle class families have become greenhouses for the cultivation of human capital. Children raised in them are on a different track to ordinary Americans, right from the very beginning,” he writes. The upper middle class are “opportunity hoarding” – making it harder for others less economically privileged to rise to the top; a situation that Reeves says places stress on the efficiency of the US economic system and creates dynastic wealth and privilege of the kind the nation’s fathers sought to avoid." That makes sense. The fact is, class mobility has been declining in the United States. The lack of movement up and down the economic ladder, which itself is a product of growing inequality, serves to magnify the obscene levels of inequality in the United States. The two longstanding myths about U.S. economic and social structures—that classes don’t exist and, even if they do, there is plenty of movement between them—have been shattered in recent years. But Reeves needs to take another look at what’s going on. 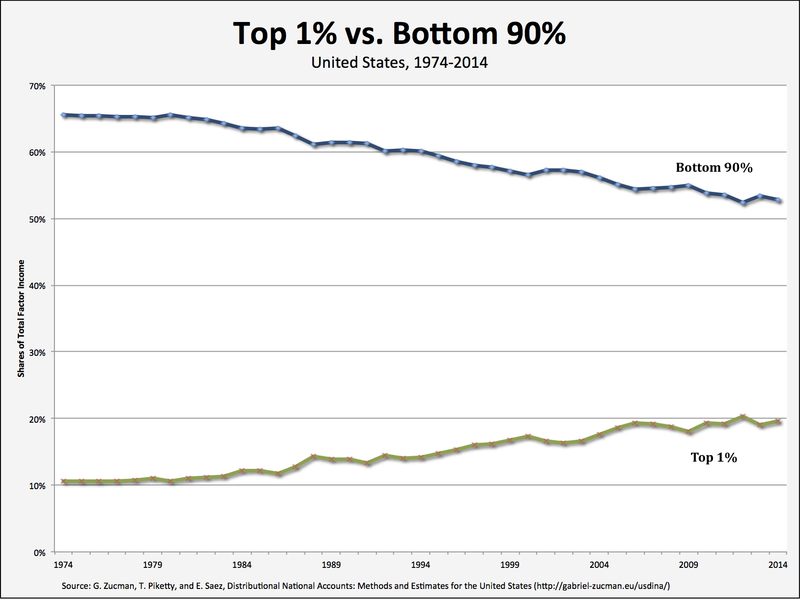 First, it’s not an either-or issue—the top 1 percent or the top 20 percent. Both groups are pulling away from the bottom 90 percent. 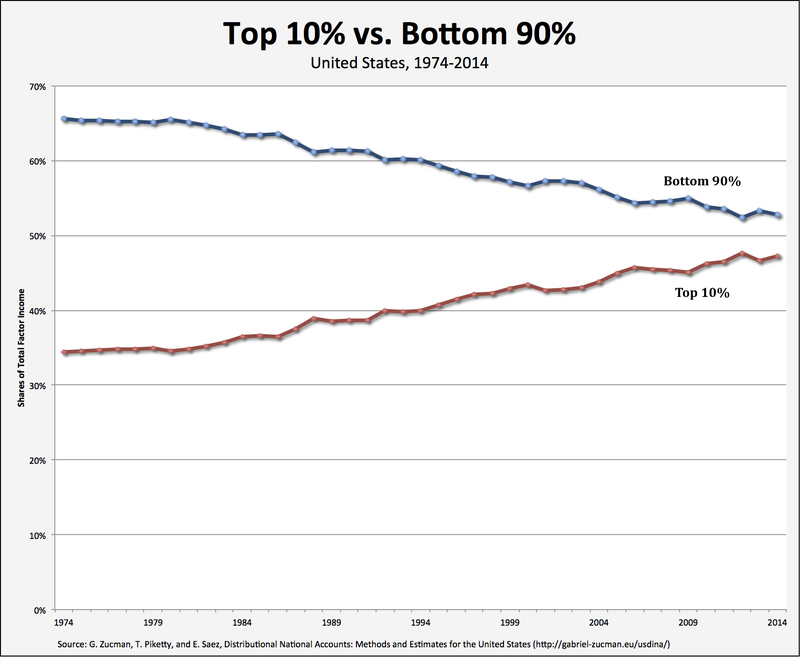 The share of income going to the top 10 percent (since I don’t have data on the top 20 percent) has soared over the course of the past four decades from 34 percent to 47 percent. Meanwhile, the share going to the bottom 90 percent has fallen precipitously, from 66 percent to 53 percent. The members of the top 1 percent have also pulled away from those at the bottom, since their share of income has grown during the same period from 11 percent to 20 percent. Both groups—the top 10 percent and the top 1 percent—are pulling away from and leaving everyone else behind. But there’s also a difference between them, which Reeve also misses. Whereas those at the very top are responsible—via their membership in boards of directors of large corporations as well as their role in sole proprietorships, partnerships, LLCs, and other business forms—for appropriating the surplus, the rest of the top group tend to get a cut of the surplus. In other words, the remaining members of the top 10 (or, for Reeves, 20) percent share in the booty that is extracted from everyone else. The fact that those at the top are pulling away from everyone else is not just a matter of “legacy” students gaining admittance to top universities or well-placed internships. It’s also about the surplus they manage to capture, both directly and indirectly. That’s what distinguishes them from the 90 percent, who produce but do not share in the surplus—or, for that matter, have any say in what happens to the surplus. Reeves’s major concern is to celebrate and restore the idea of meritocracy. I get that. The question he doesn’t pose, however, is: where’s the merit in excluding those in the bottom 90 percent from having a say in how much surplus there will be and what to do with it once it’s produced? The fact is, the organization of U.S. economic and social institutions means that those at the top, whoever they are and however much they might change, are in a position to capture and do what they want with the surplus everyone else creates. That’s why the current system is “rigged” and those at the top are pulling away from the vast majority at the bottom. Its all mentality. No one wants to talk about the fact that today more than ever we have loads of people from the bottom making it to the top. The problem is when they get there they still have the ideas and mentality to take anything they can to help propel themselves forward (poor mentality). You also have to take in to consideration different parts of the country. In : <a href=“”https://www.thesmoothbar.com/hillcrest.html">https://www.thesmoothbar.com/hillcrest.html">San Diego</a> someone may be making what is considered federal middle class and still unable to provide for their families. These people still need help although the federal government (and many times the state) may not think so. Small Business owners, struggle to make ends meet as they decide daily what funds go home to their families and what funds stay in the business, all with the federal government looming over them to see how much of a cut they get. I am really not aware of economics from my childhood. Once i got an article to write on this topic, but i was very much confused what to write at that time. Then i took help from https://www.assignmenthelperuk.co.uk blogs online to write down my topic on economics.